The ozonation system Stream Ozone – is an integrated solution for disinfection of poultry houses and hatcheries. Ozone is a strong disinfectant which due to its gas state fills the entire volume. The air and all exposed surfaces in the room are subjected to disinfection. The ozone multipurpose application for different processes is a key to increasing the performance indicators of poultry farms. Most often the heat stream treatment is used for container disinfection; however this method is not suitable for plastic and cardboard containers, because it leads to their damage. Ozone disinfection of container is carried out at room temperature; safety and complete disinfection of the container are provided. 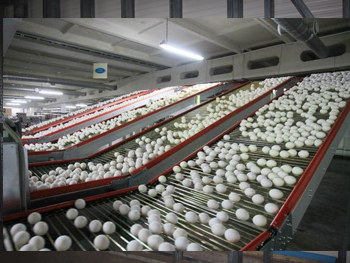 Ozone treatment of a hatchery egg allows greatly reducing of bacterial contamination of its surface; it has a positive effect on hatchability. The hatchability and safety increase by 10%. Refrigeration equipment is used for increasing the storage life of poultry products. Cold slows down the processes of product injury which are directly connected with microflora growth on its surface. The ozonation eliminates microflora on the surface of stored products and increases significantly the term of product storage maintaining its original quality. Ozone disinfection of premises leads to elimination of the most of unwanted odors. Deodorization effect is one of the pleasant additional results of ozone treatment. All unpleasant odors disappear from premises after ozone disinfection. The pronounced effect of deodorization is one of the pleasant side properties of ozone.